Week 42 – Is it time to come home to yourself? The waning afternoon sun cast soft golden light on the trees in our backyard and I thought to myself, I really should go for a walk in the woods to enjoy the beautiful autumn colors. But instead, I went into my office to prepare this week’s newsletter. I wanted to share another excerpt from my upcoming book, Waking Up in Winter: In Search of What Really Matters at Midlife. (It’ll be released on December 19th). Like the lilacs and peonies that pay an oh-too-brief visit in spring, the autumn colors are changing too quickly this year. The weather has been so dry that the leaves are turning faster than usual. The sugar maples in the front yard have gone from yellow to orange to red in just a few days. A few days! My psyche needs time to make the transition. The more I value that which tugs at my heart—nature and the beauty of the changing seasons, things that feed a growing hunger—the more crucial they become. Autumn is a time of surrender, a slow release into the reality of death, but I don’t want to surrender sooner than I must. The fading light, the cool breeze that brings a chilling hint of winter, and the geese flying overhead at the start of their migration force me to face the fact, once again, that everything ends. Endings. It’s the theme this year. I seem to be entering a stage of life where I feel compelled to stop for a while and reflect. I need a long, deep breath. Space to digest my life thus far. I want to search my history for wisdom and for those things I value most so I can keep them front and center. I know that’s why I feel so drawn to nature—the place that hosts my curiosity. As a kid I spent hours sitting under trees, staring at clouds or at birds in flight. I’d get lost in the woods looking for insects and wildflowers and snakes. The outside world was a magical place, full of life, always presenting something new to marvel at—baby birds in a nest, the forsythias planted by my grandfather, their yellow arms reaching this way and that, or the green shoots that materialized in just a few days after planting a garden. The outdoors was my home away from home, a place to find myself, free from the noise of a big family. Today, nature rescues me from a different kind of noise. The busyness of my life. The worry that accompanies ambition. The endless thoughts about all that must be done. 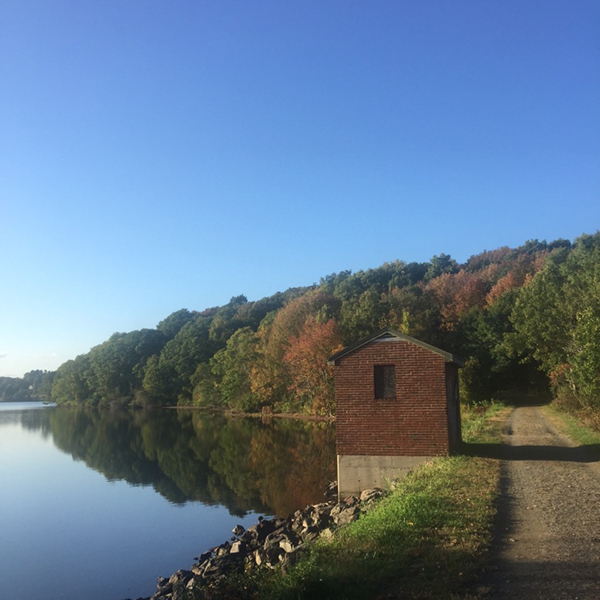 As I walk along the reservoir, hike through the state park near our home, ride waves in the heat of the summer, or simply stare out over the fields in our backyard, I feel transported, reconnected to something ancient and true. I can count on the trees and the wind and the water to remind me of what matters most to my soul. Yes, that little girl was on to something. I’m ready to come home again. Needless to say, I went out for a walk and returned to this newsletter afterwards. While wandering through the fields, I discovered milkweed pods and spread the seeds in the hopes of growing more food for the Monarch butterflies. When I came to the edge of the woods, the repeated hooting of a Great Horned owl kept me company as I marveled at the orange and red leaves reflected in the water of the reservoir. I felt that old familiar feeling of gratitude and connectedness, both to myself and the greater Oneness of life. When’s the last time you went for a walk in the woods or wandered through fields? Is it time to come home to yourself, too? Here’s a beautiful nature sight from another part of the world. Check out the video here. Thanks, Ileen!